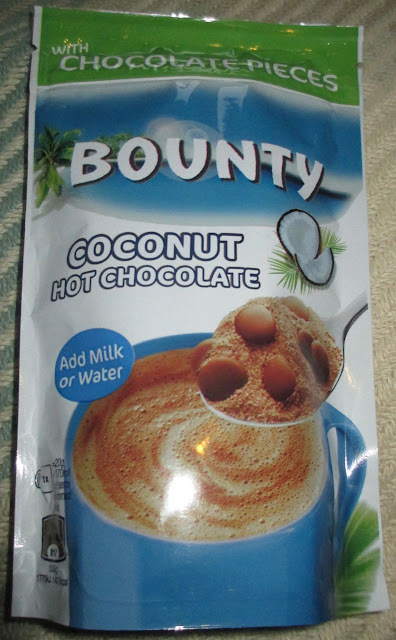 Following on from the rather delicious Bounty spread I tried the other week, the other new coconut product on the shelves is this new Bounty Coconut Hot Chocolate. Unlike the spread this does actually contain chocolate, and of course plenty of coconut. The drink states that it can be made with either hot milk or hot water, but for me it has to be hot milk for a proper drink. 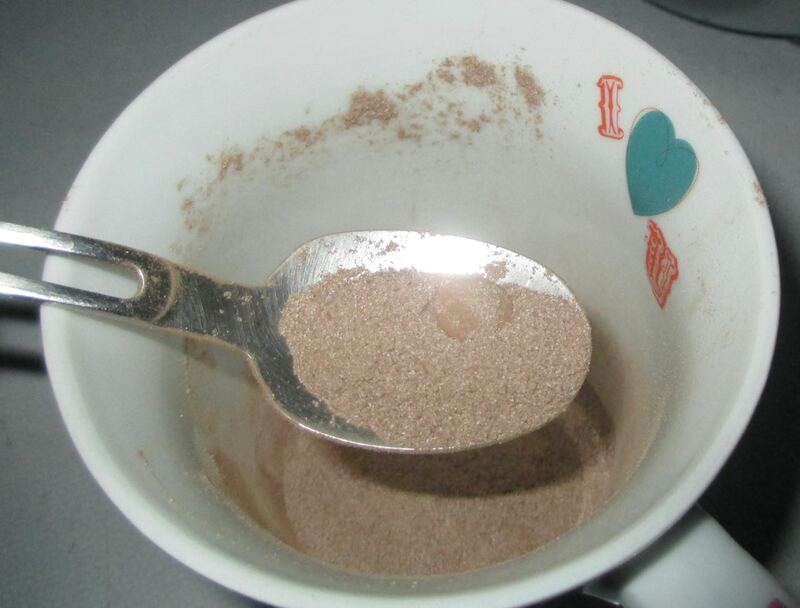 The pack states that you need three teaspoons per mug and that the drink has “chocolate pieces”. After I had put some in the mug I had to fish around to find the chocolate drops to take a picture of, they were there but there weren't that may and they blended in wth the powder as it was all the same colour. 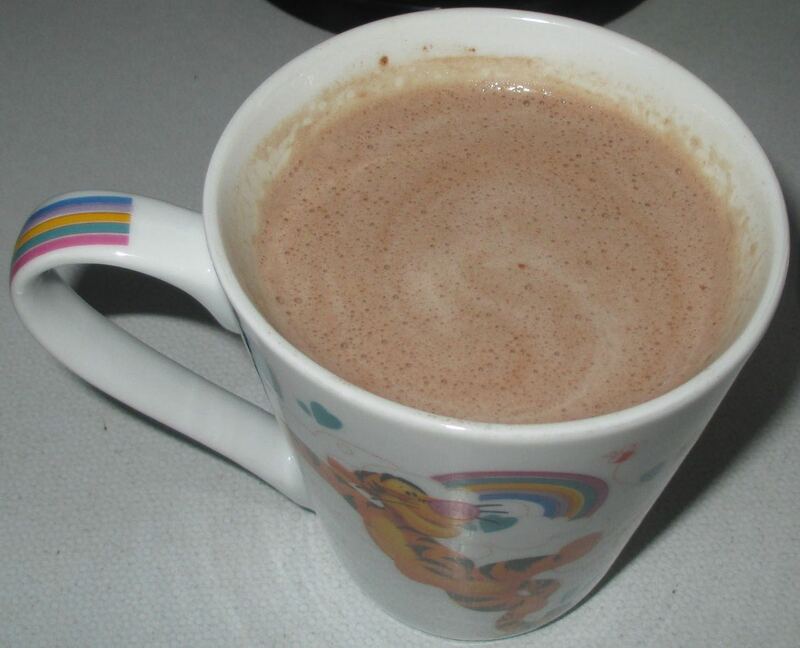 I microwaved some hot milk and mixed it all together, the chocolate and powder dissolved easily and well. It's so quick and easy to microwave milk, and did I mention these drinks are so much nicer with milk than water. I took a sip and was very impressed with the flavour of the Bounty hot chocolate. The flavour of coconut was soothing and very creamy. The sweetness from the chocolate was spot on and the milky base worked well. It was very much like drinking a liquidised Bounty bar, which was certainly its aim. The balance of coconut and chocolate was at a good level, and it managed to feel pleasingly tropical too. My only negative comment is the pouch this hot chocolate comes in. They cost £1.80 but don’t have much contents at all, it will get used up in no time, particularly if you are making drinks for two. It is not like having a proper jar of the stuff. Still the drink is a bit of a treat and not an every day drink, but I would just prefer a bigger container!